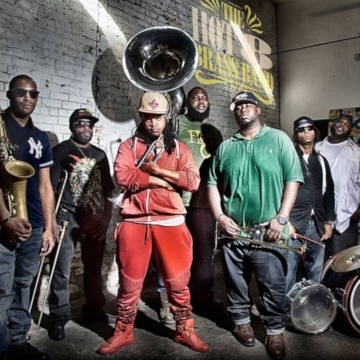 Grammy Nominated New Orleans based brass band The Hot 8 Brass Band blends hip-hop, jazz and funk styles with traditional New Orleans brass sounds. For over 20 years one of the most popular and visible funk-style brass bands in community parades and funerals has been the Hot 8 Brass Band. In 1996 sousaphone player Bennie Pete was instrumental in merging two former Fortier High School student groups, the High Steppers and the Looney Tunes Brass Bands, to form the Hot 8. The players grew up together and maintain strong, family-like bonds and regular membership. Most of them were born between 1975 and ’87 in a generation that grew up hearing mainly modern-style brass bands in community functions.